So the Mueller report is finally in, and it appears that hundreds of millions of Americans have, once again, been woefully bamboozled. Weird, how this just keeps on happening. At this point, Americans have to be the most frequently woefully bamboozled people in the entire history of woeful bamboozlement. If you didn’t know better, you’d think we were all a bunch of hopelessly credulous imbeciles that you could con into believing almost anything, or that our brains had been bombarded with so much propaganda from the time we were born that we couldn’t really even think anymore. But let’s try to look on the bright side, shall we? 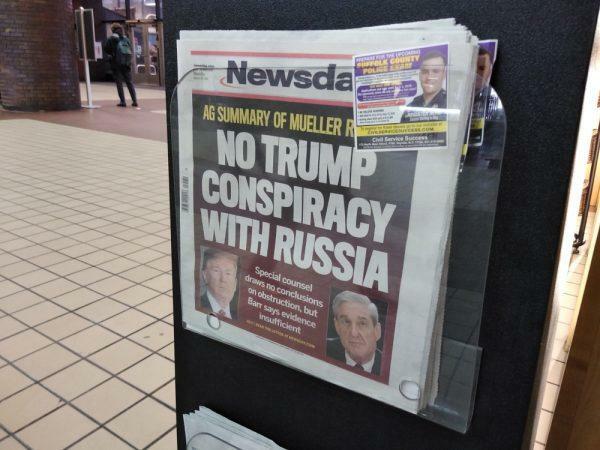 Disgraceful as this Russiagate fiasco has been, at least it was all just an honest mistake, and not any kind of plot, or conspiracy, or anything as disturbing as that. It’s not like the majority of the corporate media perpetrated a massive, coordinated, intelligence agency-initiated psyop on the Western public for two and half years. No, they just “got it wrong,” again … like they did with those Iraqi WMDs. Plus, there is no “deep state.” Not really. That’s just one of those right-wing conspiracy theories that only Trump-loving fascists believe in. I mean, it’s not as if elements of the FBI, the DOJ, and the DNC paid a former MI6 spook working for a Washington PR firm contracted by a Washington law firm contracted by the Clinton campaign to fabricate a “dossier” alleging that “the Russian regime [sic] has been cultivating, supporting, and assisting Trump for at least five years” in order “to sow discord” within the Transatlantic Alliance, and then fed that fabricated dossier to their contacts in the corporate media, who used it to generate mass hysteria, which the Congress then used to justify the appointment of a special prosecutor, whose investigation of the allegations contained in the fabricated dossier the corporate media and deep state types used to generate even more mass hysteria … and so on, until hundreds of millions of people actually believed that Donald Trump was some kind of Russian intelligence asset, and was going to be impeached and tried for treason. And as for the non-existent deep state, and the Democrats, and the corporate media, and the millions of Americans they accidentally bamboozled … well, I imagine they’re feeling pretty silly right now. So this is not the time to demand a full accounting from the patriots in the intelligence community, or to compare the professionals in the corporate media to the keys of an enormous Goebbelsian piano mechanically hammering out whatever tune the ruling classes decide to play. Yes, they made a few mistakes, and got a little carried away, but they’re only human, after all. I’m sure they’re all very, very sorry, and will never, ever, do it again.